Discoverer: Albert Ghiorso, et al. Lawrencium, a synthetic element, is made from californium and has no known uses. Little is known about this element, but its appearance is likely to be silvery-white or gray. Preliminary work on the element indicates that it behaves like actinides. 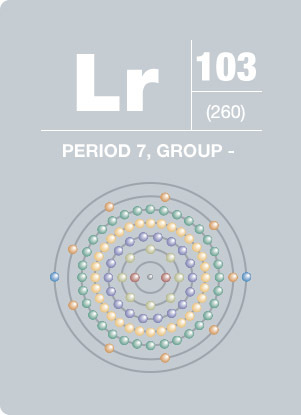 Eleven isotopes of lawrencium have been synthesized and the longest half-life of the eleven was 216 minutes. Lawrencium was named after Ernest O. Lawrence, who invented the cyclotron, an instrument designed to accelerate beams of charged particles.